I caught the 'crochet/knitting bug' when I was pregnant with Talha and made beanies, pouches, mobile covers etc for a charity sale. Though we were taught to crochet in school, I never liked doing it. Infact, I remember asking my friend to finish a project for me so that I could get a grade and pass out. I guess I didn't like the crafts teacher much which affected my crocheting skills. I learnt so much about crochet and knitting through YouTube - such a lifesaver, I tell you. Videos by Teresa are very simple and easy to understand. She also replies to your queries very quickly. 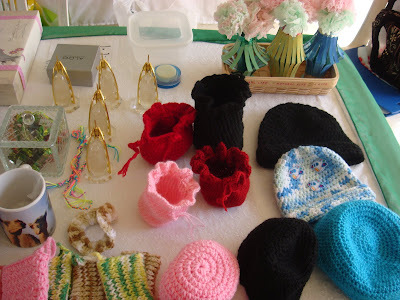 Only the crocheted and knitted stuff shown here are mine. Rest were made by others or store bought. During my second pregnancy, I caught the 'embroidery' bug. haha. I bought this pattern through Etsy. I also made these cute felt hankie holders for a charity sale. I remember taking pictures of those, but just can't find it on my pc or camera. aaaaargh! So, I've copied the pictures from marthastewart.com. Let me check my folders again. Meanwhile, you could find the tutorial here and here. Found it! Erm, just one of them. Still searching for the felt hankie holders. I should have taken a photo with some toiletries in it. Well, no point crying about it now. It's already sold. ha! I also took some tailoring classes (on Indian salwar kameez only) when pregnant with Aisha. I was soooo excited when I got my first sewing machine. It is second hand and looks really old. But I love it every bit. I made a shopping bag out of an old pillowcase with my lovable sewing machine. :) You could find the tutorial here. Very impressive- I love how you're always keeping busy doing a billion things. Keep goin! wow, pretty amazing, keep it up!!! Neelu....so beautiful things my dear...an yes..even i remember our craft teacher :-D hehe..I.just admire ur passion my dearest friend!! !